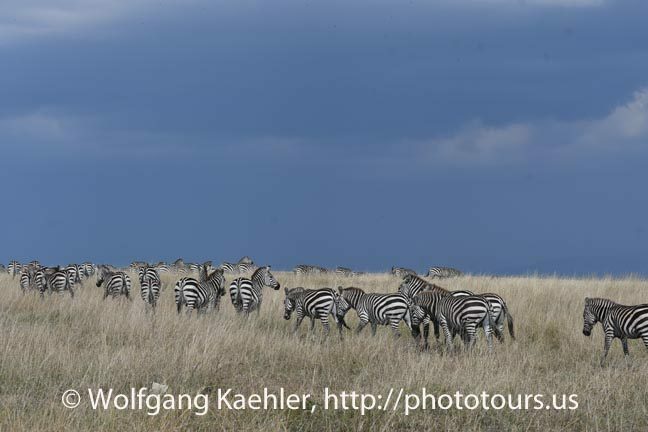 Kenya Photo Tour 2018 – the last days By Michelle Alten Day 10 On the move to another area today, we followed the Mara River. Here hippos bathed. Almost completely submerged, the hippos resembled river rocks as they peered out of the rambling water. 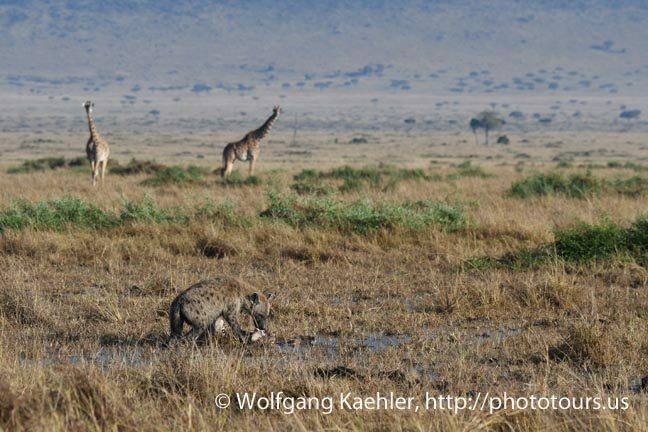 A hyena feasted on a young giraffe, while other giraffes looked on in the distance. Ready for a break, we breakfasted while looking out on the inviting mountains and lazy plains that created the setting for the film Out of Africa. Our drive continued past sprawling Masai villages. Here fences appeared where once communal property was open and free for herders and their cattle. Apparently private land ownership is changing the traditional way of life. 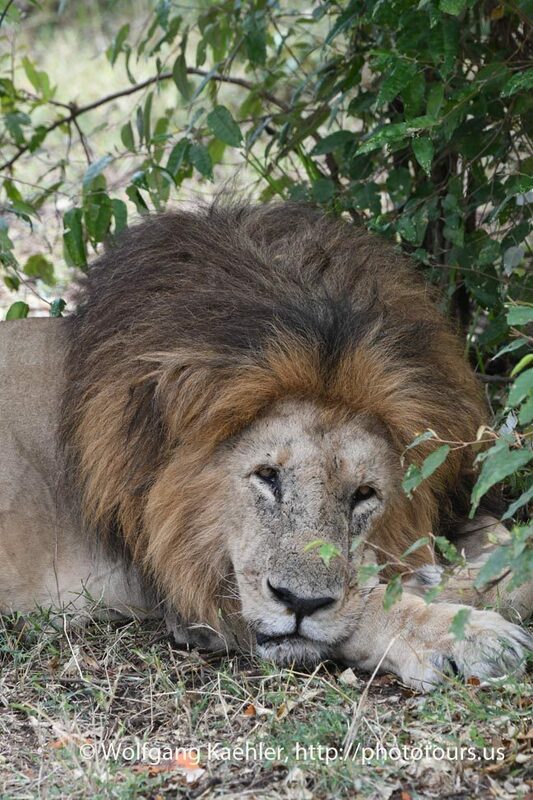 The fences and overgrazing are clearly impacting wildlife, particularly lions that once roamed and hunted in this area. Was this an example of the age-old conflict between ranchers and wildlife? 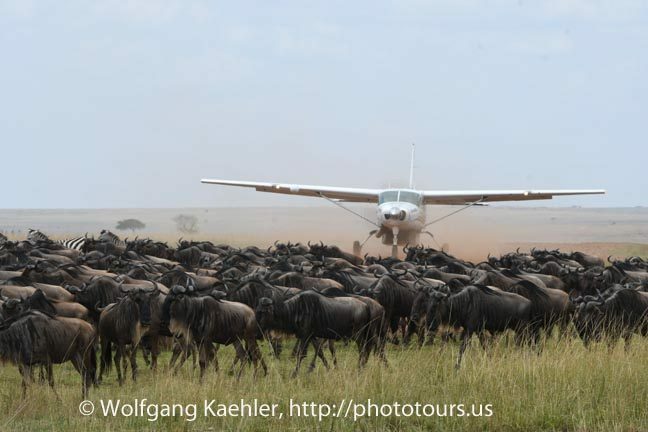 I explored articles and found this one by Daniel Sopia is CEO of the Maasai Mara Wildlife Conservancies Association (MMWCA). 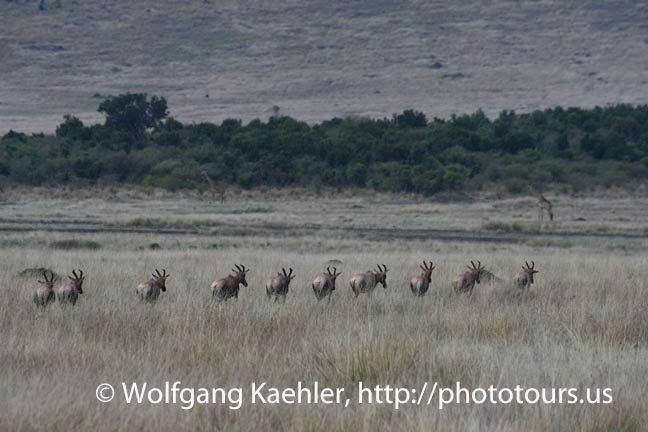 Sopia describes an effort to form conservancies, leasing land from large numbers of landowners, is seeking to protect habitat while providing income for local landowners. 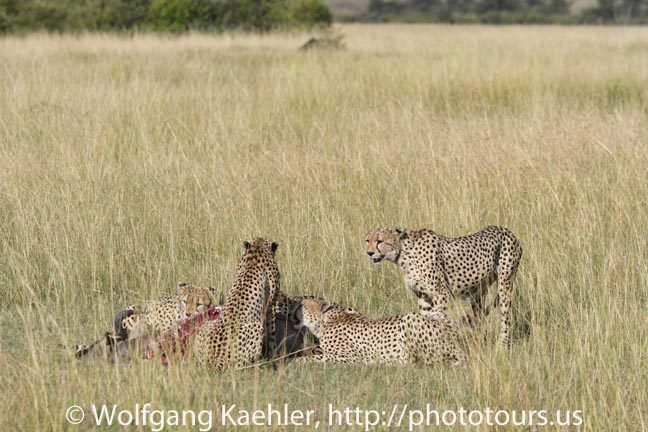 Later in the afternoon, we experienced the climax of the day: the sighting of cheetahs. A band of five brothers fed determinedly on their kill, and a mother with three cubs hunkered down in the grass in a driving rain. 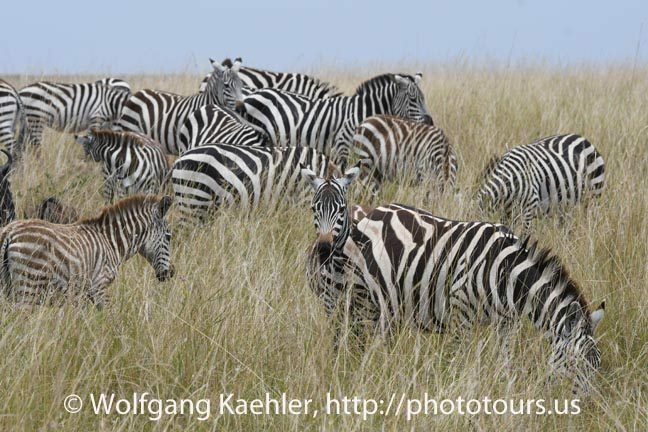 Day 11 Today we scanned the swaths of woodlands bordering the savanna as we searched for leopards. Peter, our guide, explained that the leopards are doing well in Kenya because they are so adaptable. Apparently, they even are found roaming Nairobi! Our efforts were rewarded. We discovered a mother with two large cubs, sequestered in a thicket. 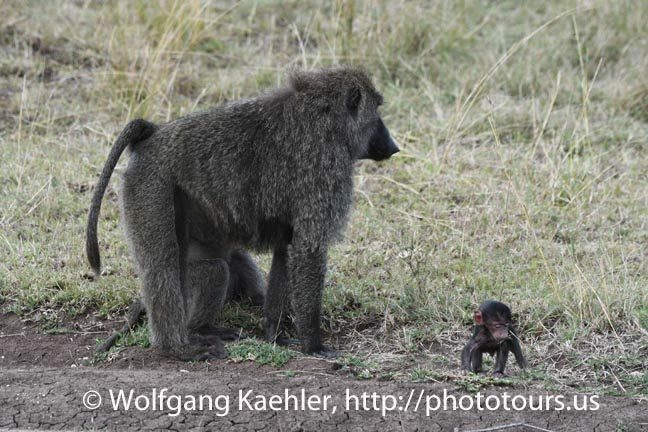 While their mother slept, the two youngsters sat and waited for her, peering out between the leaves and branches. By nightfall, they surely would head out on a hunt. 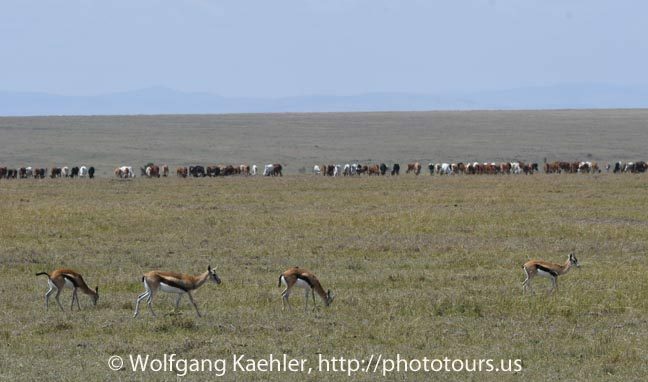 Day 12 While viewing the leopards and cheetahs, we frequently joined other jeeps of visitors and photographers. 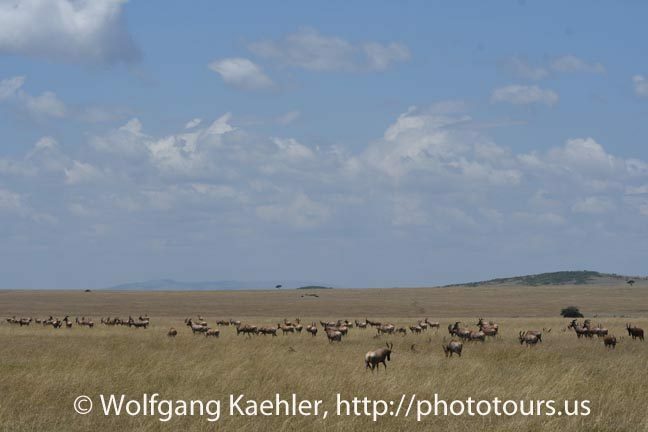 This morning, however, we were able to enjoy the quiet and solitude of the Masai Mara. We bounced through the river where hippos rose and submerged beneath the current. Bee eaters with their brilliant green plumage perched on rocks, while giant herds of zebras marched through the tall grasses. 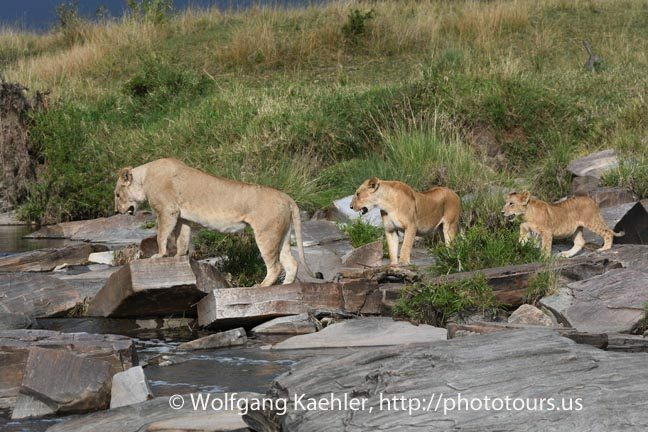 In a vast meadow, four lionesses hovered around a giant buffalo kill—one feeding while the other rested after their meal. Nearby, two hyenas and a marabou stork looked on, clearly wondering about their chances at sharing in the bounty. Day 13 This morning, I awoke in our tent to an astoundingly diverse choir of birdcalls. While our group was out photographing lions, I stayed in the camp to soak in the dawn. A dainty dik dik slipped between the trees and a bushbuck emerged for a moment before disappearing into the brush. Across the river, five giraffes sauntered past, their neck and heads rising above the trees. I learned at breakfast that leopards leap the fence and surreptitiously roam the compound, so I kept my eyes glued to the trees. After an afternoon of viewing lions, we returned for a celebratory barbecue. We all gathered in a tent around a long table with our guides. “Asante Sana”, thank you, we told our hosts one more time. 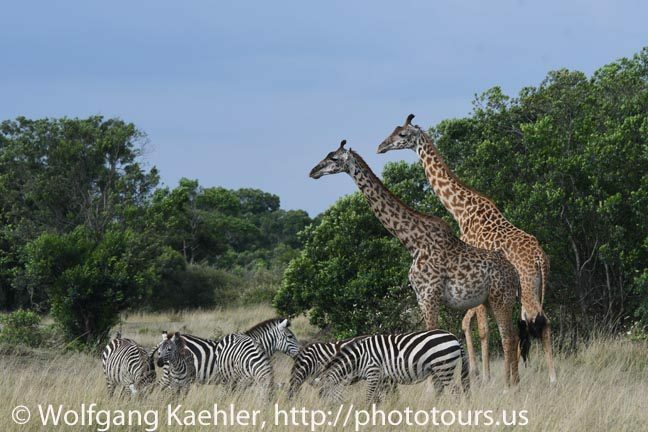 We had practiced our few Swahili words throughout the trip, and I had come to love the language. Its lilting, sing-song, words danced on my tongue. Lala salama. Hakuna matata. Tutaonana. If I were in my 20’s I would have ditched the flight home and stayed to learn this beautiful language. Alas, I boarded a small plane for Nairobi. On its side was a bold red and black sign that read: Hands Off Our Elephants. 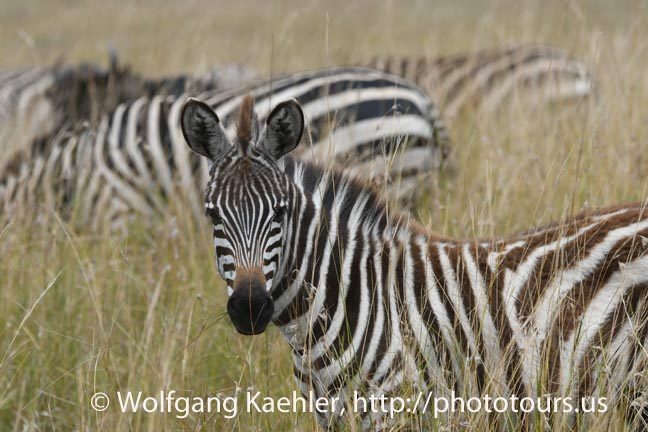 I could only hope that international collaboration could save and protect all the wildlife species here. 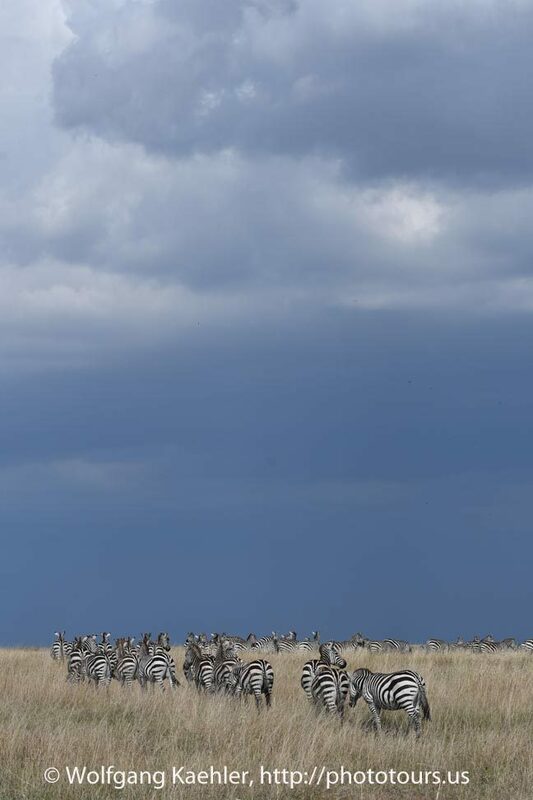 As we flew off over the savannah, herds of wildebeests, zebras, and giraffes, roamed through the golden blanket of the Masai Mara.